Myelopathy describes a disease of the spinal cord where the spinal cord is dysfunctional. This may be secondary to mechanical compression or non-mechanical reasons. A patient may develop symptoms after an accident or the patient may develop gradual symptoms. 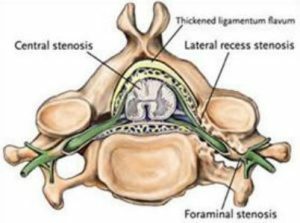 Commonly, the cervical spine is a site of myelopathy where bulging discs, thickening ligaments within the spinal canal, or protruding bone spurs may compress and deform the spinal canal. This results in decreased blood flow to the spinal cord and spinal cord dysfunction. Patients may present with hyperreflexia, or spasticity, where stretch on the muscle’s tendons elicit a rapid movement or uncontrolled shaking. Patients also initially may present with altered fine motor activities such as handwriting dysfunction, difficulties with buttoning their shirts, or in advanced cases, lose the ability to walk. A history of physical exam often can detect signs and symptoms of worrisome myelopathy. Patients may present with weakness, especially the hands, and typically have hyperreflexia with increased reflexes occurring below the level of the spinal cord compression. Advanced imaging such as MRI and CT scan are used to evaluate the compression of the spinal cord. Patients who are diagnosed with myelopathy are usually referred for surgical intervention because this often is a worrisome progressive disease, and the patient is at risk for developing neurologic weakness including quadriplegia or upper extremity dysfunction, especially with trauma.